STUTTGART, Germany — 3 Screen Solutions (3SS), leading provider of software solutions for set-tox box (STB) and multiscreen digital entertainment, announces the launch of a new pre-integrated solution aimed to help operators optimize and launch Android TV services. The 3READY Custom Launcher enables operators to reap the maximum potential of Android TV deployments. It delivers a much richer user experience than a standard launcher, while enabling customization and branding, thus supporting operators’ marketing objectives. 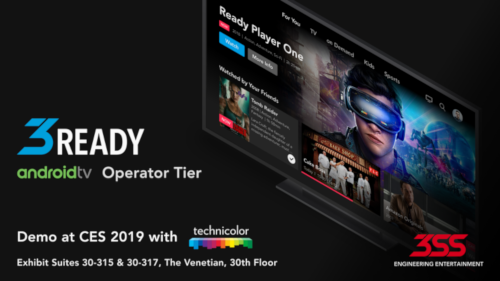 Now fully compliant with latest version Android P, 3SS and Technicolor are working together on further major new Android TV Operator Tier projects, to be announced. 3SS has a deep history in Android deployments, having delivered award-winning Swisscom TV 2.0 in 2014, and in 2018, Canal Digital OnePlace and Com Hem TV Hub, which has scooped up numerous prestigious industry accolades. Published in September 2018, an information-packed white paper looks closely at the Com Hem Tv Hub project, and shares insights gained by acknowledged Android TV leaders 3SS and Technicolor from working on Android TV projects around the globe. Click here to download “Deploying Android TV STBs: The A-Z of Android, including Operator Tier”. CES 2019 visitors will be the first to see the solution demo on Technicolor stand.